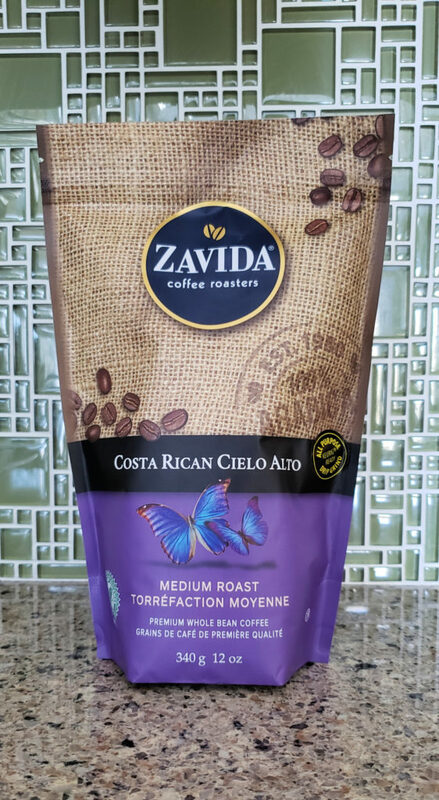 Canadian Blog House recently discovered there are many reasons to love Zavida coffee after getting the chance to review several varieties of Zavida Coffee Roasters coffee. All opinions are our own. I’m no coffee connoisseur, however, I do pride myself on knowing the taste of a great cup of coffee. After all, I start each and every day with a hot coffee in hand. Mornings just aren’t right unless I have my coffee. I blame my love of coffee on my dear mother who gave in to my (likely) incessant whining for a sip of her coffee – at the ripe old age of four! When I think back, I’m actually surprised I grew to love coffee so much. A cup of java, made at home in the 1970s, wasn’t like the coffee we brew in our kitchens today. In our house, coffee came in hard little brown nuggets in a glass jar, melted into hot water, to become instant coffee. Of course, as a kid, what I thought was “coffee” was really a few of those hard little brown nuggets, a mug full of milk, and a touch of sugar. What I happily called coffee, was really more like flavoured milk. Much has changed about my taste in coffee since – and thank goodness for that! I literally perked up the day I received an email from the folks at Zavida Coffee Roasters. Of course, I said yes to taste-testing all the coffee! What coffee lover would turn down 10 varieties of Zavida coffee and 3 mini-bricks? Not this coffee lover, that’s for sure! Now I’m fully convinced…mornings were made for Zavida. The fact that Zavida Coffee Roasters is a Canadian company, puts this reason to love Zavida coffee at the top of our list. What will probably astound you about this Canadian coffee company is their age. Zavida coffee has been producing some of the finest coffee in Canada for over 37 years! For those of you in Toronto who love Zavida coffee, I have more great news. You can enjoy your favourite Zavida coffee in person at their flagship Zavida Coffee cafe at 382 Yonge Street (north of Gerrard Street). While doing some research for this article I was shocked to find out about the Zavida Coffee cafe. Not only had I never heard about it, I found out that it is located just one block north of the Chelsea Hotel, Toronto – where I had just stayed in November! I’ll be sure to stop in next time I’m in the neighbourhood, Zavida Coffee! Zavida Coffee Roasters may be known for their coffee but, this coffee company offers up much more than coffee to their visitors – both online and at their cafe. In addition to over 40 varieties of premium 100% Arabica coffee, you’ll find a world of great products including artisan loose leaf teas, gourmet beverage flavourings, and gifts any coffee – or tea – lover would enjoy. For coffee lovers, the smell of freshly ground coffee beans, and the aroma of a freshly poured cup of coffee, teases our senses. Ultimately though, a great cup of coffee is all about the flavour, right? Our favourite so far? The Costa Rican Cielo Alto which, by the way, is Zavida’s signature coffee. What more could a Zavida coffee lover want than a freshly brewed cup of their favourite Zavida coffee? The Zavida Coffee cafe has it all. You can also enjoy access to free WiFi when visiting the cafe for your favourite treats! Zavida Coffee will even bring their gourmet cafe experience to your door with their catering service. Catering for every group and every size! Can’t buy Zavida coffee near you? No worries! Canadian Zavida coffee lovers can order their favourite coffee online and get free UPS shipping on orders over $65 or more! My American friends and family, you are also in luck! Zavida coffee can be shipped to the US (excluding Alaska and Hawaii)! Please see Zavida’s shipping policy for more details! Get the Scoop And Earn Great Perks! Sign up for “Zavida Perks” and you can earn points that will add up to free coffee, discounts, referral bonuses, birthday rewards, and more! Be sure to sign up for this great rewards program and starting earning points towards free Zavida coffee! Coffee lovers get 100 free Zavida points just for signing up! That starts you off with a mini-brick, a Zavida mug, or a bottle of Hazelnut Flavour Shots To Go! Calling all flavoured coffee lovers! Zavida coffee makes the world’s first unsweetened gourmet syrup made for brewed coffee – MiniSyrup! Zavida MiniSyrup is great for flavouring all your favourite beverages like coffee, hot chocolate, lattes, soft drinks, tea, and more! Want to be known as the world’s best boss? Zavida can help! Zavida Coffee Roasters is one of the most popular wholesale coffee brands in the world. Zavida’s largest distribution channel is Costco Wholesale. Coffee lovers can find a variety of Zavida coffee on shelves at their local Costco store. You may be surprised to find out that Zavida is also a private label manufacturer of delicious coffee. In fact, you may have already been drinking Zavida coffee for years – without knowing it! Zavida is serious about their coffee – and about protecting the world we live in. Our thoughts on the taste of Zavida coffee? After taste-testing 4 of our Zavida coffee varieties so far (Costa Rican, Kenyan, French Roast, Columbian), we can officially call ourselves Zavida coffee’s newest fans. While the Costa Rican coffee may be our favourite (so far! ), we still have many other varieties left to taste-test. Why haven’t we tried them all yet? While we could have scooped into each bag for this review, we decided to be a little selfish and save a few bags for later. We want to savour our Zavida coffee experience. Wouldn’t you? We love Zavida coffee and can’t wait to scoop into all the other varieties we still have to try! We’ll be updating you on those via our Instagram stories, so stay tuned! 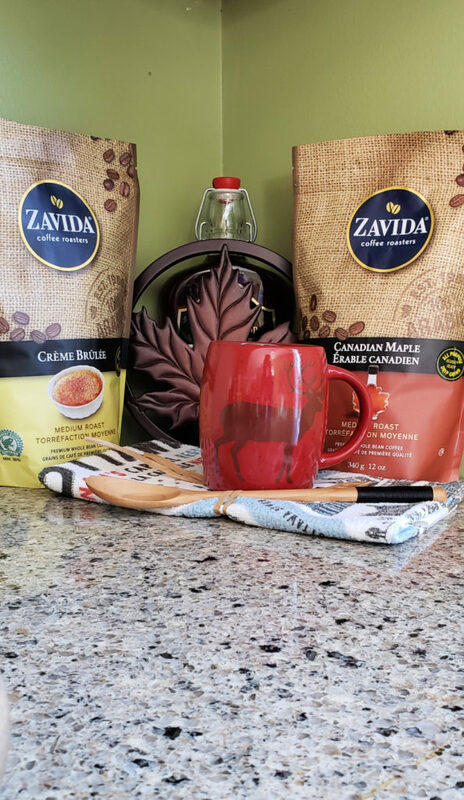 The fine folks at Zavida Coffee Roasters want to give THREE lucky Canadian Blog House readers the chance to WIN 2 boxes of Single Serve coffee OR 2 12oz bags of your choice!! Don’t forget to follow @CanBlogHouse on Instagram to see all our Zavida coffee stories! You can find them in the Zavida “highlights” section! we love coffee in our house!! I would love to try butter pecan coffee!! Say what?! I would absolutely love to try the Bavarian Chocolate Coffee! I would love to try the Coconut Delight Coffee,bet it’s yummy.My husband is a huge fan of the Hazelnut Vanilla Coffee,he loves this brand. Would love to try the Bavarian Chocolate Coffee to serve with dessert at a dinner party. Sounds delightful and delicious. I would love to try the Amaretto Almond Coffee. I would love to try the Apple Pie coffee! Could anything sound more delicious! I would love to try the Chocolate Coconut Coffee! Creme brulee!! I have been drinking their Hazelnut vanillia for years but never thought to try other flavors. Ohhh sounds yummy. Would love to try Chocolate Coconut. That too me would be heaven in a cup lol. I would love to try Chocolate mint! I would love to try the Brazilian Santos Coffee. I would love to try the Apple Pie Single Serve Coffee Cups. There is so much flavours to choose from but I would love to try the Bavarian Chocolate coffee flavour. The Chocolate Coconut sounds incredible! I would love to try them all. I would love to try the Bavarian Chocolate Coffee. I like the concept of this Canadian company. I’m a coffee lover and always interested in trying new flavours.and brands. I haven’t tried a maple coffee yet. Hahaha, I love the “Holy ship” part. Made me laugh! I’d love to try the Canadian Maple as well as many other flavors as they all sound delicious. I would like to try a lot of them maybe start with the Canadian Maple. I’d like to try Bavarian Chocolate Single Serve Coffee Cups – 24ct! They have lots of coffee I would like to try but Canadian Maple Coffee really caught my eye. I’d love to try the Bavarian Chocolate Coffee! My husband is a fan of the Hazelnut Vanilla one from Zavida… and he’s got me hooked. He’s been buying it from Costco for so many years, and it’s a weekend brew each morning. Soooo good! I’d love to try the Almond coffee! Having just visited Costa Rica and tasted many coffees I would love to try the Costa Rican Cielo Alto a medium blend! It sounds delightful!